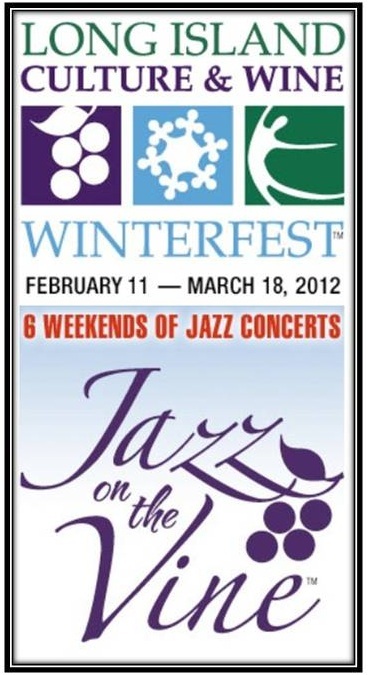 This coming weekend at the Winterfest Jazz on the Vine visitors will find some incredible performances. As Winterfest Jazz on the Vine winds to a close for the year in the last two weekends of events, there are still more than ten events to attend. Designed and focused on alleviating the mid-winter cabin fever, this fifth consecutive year of incredible jazz performances continue to awe its crowds. The entire east end of Long Island will be alive and celebrating with good times for music and wine lovers alike. In support of the 2012 Winterfest Jazz on the Vine events Shorecrest Bed and Breakfast has created their own special two night accommodation package for guest during the festival and through April 15th. A $25 gift certificate that is good towards a dinner for two at Noah’s or the Frisky Oyster, two of Greenport’s favorite restaurants. A $50 gift certificate good for one hour of aromatherapy massage for each visitor. An exclusive discount card to 24 wineries which can include some free tastings. A private wine class or champagne in-room picnic. Make sure to ask your hosts at Shorecrest Bed and Breakfast about other activities in the area once you are here, until then, check out www.shorecrestbedandbreakfast.com to book your reservations online after checking the availability on your preferred travel dates. If you have any questions call Marilyn at 631 765 1570. This year’s program of events sponsored over 70 performances at 20 different participating wineries. Included in the price of admission to Winterfest Jazz on the Vine is a glass of wine and the chance to win a free hotel night on the East End as well as a gift basket of Long Island Wines. There are only two weekends of this event left so make your plans soon to come enjoy Long Island Wine Country where smooth jazz musicians collaborate with local vineyards, B & B’s, hotels, and cultural venues and attractions designed to bring you out of the mid-winter blues. See our events page for more upcoming events in the area to enjoy while staying at Shorecrest Bed and Breakfast.